Have you ever started vacuuming your floor and then realized that you could probably do a better job with a broom and dustpan? That’s actually a pretty common thought amongst people. 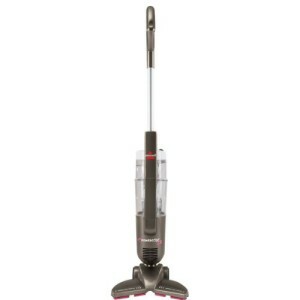 But those thoughts will go away when you get your hands on this Bissell PowerEdge Pet Hard Floor Corded Vacuum, 81L2A. 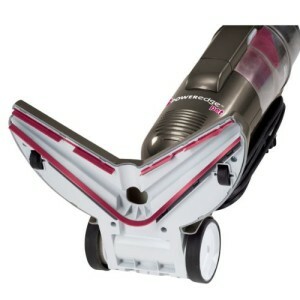 This vacuum has an innovative technology that will pick up even some of the most stubborn dirt and debris. It is fantastic for picking up pet hair because of its rubber wipers. The V-shape technology also allows you to maneuver around different objects throughout your home without missing anything. The suction on this vacuum is what makes it appealing to homeowners because it gets the job done every time. The features of this vacuum make it an appealing option for homeowners, whether you have pets or not. The best things about the Bissell PowerEdge Pet Hard Floor Corded Vacuum, 81L2A are the V-shape technology and the rubber wipers that attract hair. The V-shape wipers actually funnel the larger debris into the center, where the suction is the strongest. In the meantime, the smaller dust and debris are picked up along the outside of the V-shape. Because of this technology, it is more efficient and effective than a broom and dustpan. The rubber wipers will attract pet hair and other small debris that normally aren’t picked up by a regular hardwood floor vacuum. 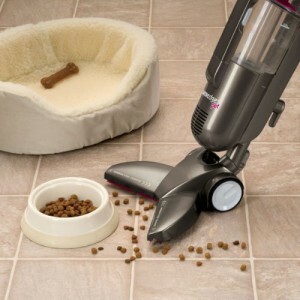 Just about any mess that your pet makes can be cleaned up quickly and easily with this vacuum. Another positive about this vacuum is that you don’t need any attachments to get dust and debris off of your floor. It has a swivel head that allows you to get the hard-to-reach areas easily. The V-shape is also great for around furniture and baseboards when you would normally have to get out the broom. There aren’t too many cons about the Bissell PowerEdge Pet Hard Floor Corded Vacuum, 81L2A, but people have said that the dust cup fills up rather quickly. Of course, if you don’t have that large of an area or your floors aren’t that dirty, then that won’t be much of a problem. Another thing people mentioned is that the 20-foot power cord is a little shorter than most other vacuums. Since this vacuum is designed for hardwood floors, it’s understood that you won’t have to take it very far from an outlet. If you have a large area of hardwood floor, then you may have to switch power outlets a couple times when you’re vacuuming. Some people also find the V-shape head hard to get used to. It can be hard to maneuver at first, but with a little practice, it gets a lot easier. If you’re used to a standard vacuum, then this one may seem a little awkward when you use it for the first couple times. You need to buy this product if you have pets in your house and if you’ve ever had trouble cleaning your hardwood floor. There aren’t many hardwood floor vacuums that can top the quality and versatility of this one. And for a price of around $50, you really can’t go wrong. Whether you have dogs, cats, birds or a combination of those or other pets, the Bissell PowerEdge Pet Hard Floor Corded Vacuum, 81L2A will get the job done. Instead of using your old vacuum and following it up with a broom and dustpan, save yourself a step and let this vacuum do it all for you. Even if you don’t have pets, this vacuum will keep your hardwood floor clean and shiny from all the dust and debris that accumulates from going in and out of your house. Bissell is a private corporation that was founded back in 1876. They have headquarters in Michigan and are widely recognized as the industry leader in home floor care products. The company began by manufacturing mechanical sweepers and eventually started making vacuum cleaners and carpet shampooers. They have earned the reputation year-in-and-year-out for being one of the biggest and best manufacturers of home floor care products due to their quality guarantees and customer satisfaction.